We should be getting some interesting news soon with the start of the Takarazuka Revue's musical run, but for now it's been rather quiet. In the interest of fairness, I am following up on my previous post about how poorly the Sengoku Basara anime performed in the UK with FUNimation's corresponding comments from the US courtesy of today's ANNCast interview. The question appears at around the 74:47 mark in the podcast and both representatives chipped in with the comments alternately. "Basara did well for us I believe? We got the movie later on because the series did well enough. The movie is good... I mean, it's an action show that is pretty warriors, fighting. So, is your target dudes? Not really! There's a lot of girl Basara fans out there. Oh yeah, have you seen the fanfic..? And the doujin for that stuff? You kinda know who your audience is. Dudes still like it but you know, there's the undertone of the ladies going 'oh yeah, fight, fight!'. I was under the impression that that was chiefly a fujoshi thing." They then went on to say they initially thought that the Negima series was a bit hit with girls until they discovered that it only started performing well when they retargeted it towards male fans. Take that as you will. Oh well, at least there's no more anime for Sengoku Basara so its average sales can't harm the prospects of any future releases. They sounded a little disappointed that it hadn't taken off in a big way; I think it's sort of cool that the distributors take a personal interest in their shows (and apparently, in the fanfic those shows generate). Moving on, the menu at the Capcom Bar (as shown in my report here) is due for its latest renewal! I was a little sad to see the changes as it means I'll never be able to eat Kojuurou's delicious pasta again. A press event was held to announce the new dishes; full coverage (with photographs) is up on the GAME Watch, Famitsu and 4Gamer websites. The delayed new Kodansha BOX novel successfully met its new release date of 3rd June 2013. Sengoku Basara 3: Chousokabe Motochika No Shou ('Chousokabe Motochika Chapter') is the first in the 'second season' of the Sengoku Basara 3 novel adaptations and covers the story from the game. Tatatsu Shinichi handles the writing while the illustrations are provided by Tsutsumi Yoshisada, the same team behind the earlier novel Sengoku Basara 3: Tokugawa Ieyasu No Shou. The book can be purchased from Amazon Japan and other major retailers for ¥1,575. Separate volumes featuring Mouri Motonari, Sarutobi Sasuke and Katakura Kojuurou will be coming later. The fifth compiled volume of Itou Ryuu's Sengoku Basara 3 Bloody Angel manga is coming up for release with a tentative date of July. No formal solicitation has been announced but listings have appeared on several online bookstores such as Honto and there have been some tweets advising fans to get ready to place their orders. Skimming Amazon Japan, I noticed some other interesting listings had appeared. It looks as though the Sengoku Basara Comic Anthology 'Dategun Chronicle' manga from earlier this year is going to be joined by a Sengoku Basara Comic Anthology 'Takedagun Chronicle' compilation at the end of July priced at ¥893. With the second issue of Sengoku Basara Magazine having Yukimura on the cover, this summer is going to be great for fans of the Takeda army! The upcoming Takarazuka musical will have a Yukimura theme as well, of course, and there's a new listing for a ¥1,000 mook titled Le Cinq Special Edition: Hanagumi Performance Sengoku Basara to go with it. The last of the new listings I found is something I'd been wondering about for a while now! At the end of the Sengoku Basara Science Laboratory blog posts that I summarised on this blog last year, writer Yanagita Rikao mentioned that the series would be making the jump to print. Well, it looks as though the book is almost ready since a listing has appeared for Sengoku Basara Kagaku Kenkyuujo, dated to debut on 28th June 2013 at ¥1,155. It's described as having a few bonus chapters that weren't published on the Science Laboratory blog plus extra material (this is possibly the content from Kuusou Kagaku Dokuhon 11 where Sengoku Basara once appeared). I'm hoping this means that Capcom is planning a big announcement soon to confirm all of the details and satisfy my hunger for more Sengoku Basara books. To close the post, I want to draw attention to a fun new experiment by Japanese character goods shop Otaku Republic. They're bundling up items which have a similar theme at a reduced price - and they're taking suggestions on board! 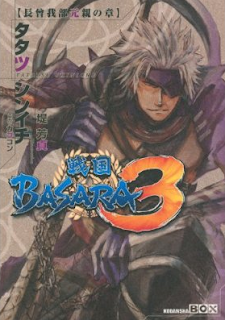 You can see their first few Sengoku Basara bundles at their Tumblr page here.